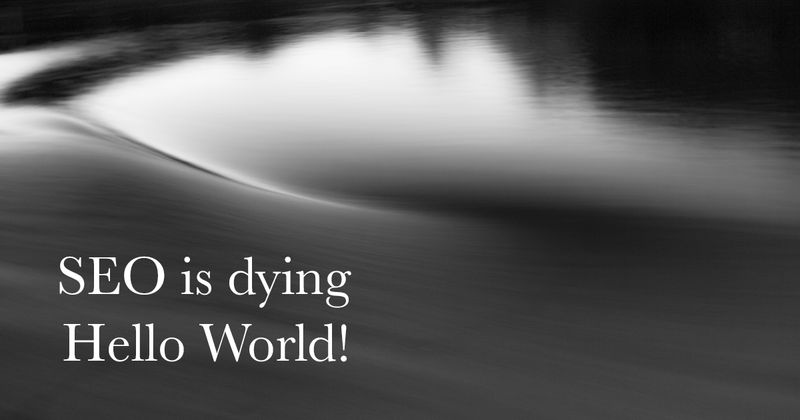 santiano.io > blog > SEO is Dying... Hello World! But is there any guideline to follow for such a post, to at least explain what, and especially why I am starting this blog? So what is santiano.io ? I realized that a few month ago that I would actually concentrate my consulting activities towards Web Analytics because I trully believe that SEO is dying, not dead yet, but dying slowly. I have been providing SEO consultancy for about 7 years now, And by only looking at how SERPs evolve, I believe there is no long term future for me in SEO, and that on the mid run, SEO will trully die, this time. That's not really making me cry. I kinda always known this would happen, the only thing I needed was to trully realize it. A few years back, when I saw Google Panda smashing price comparators websites in SEO and launching at the same time Google Product / Shopping, I understood that I would have to find a plan B for my career, and that plan B will have to become my plan A+. Back in 2016, I read this prediction from Gartner, that about 30% of all searches will be done with voice without a screen, and more recently that Stephen Kenwright in his article was reporting that ComScore was predicting that it will even reach 50% of all searches, I could not wait to test out the Google AI to try to predict how these things will look in the future. On the first day Google Assistant arrived in French. Of course... I played with it. A LOT. One or two weeks after that. Looks like a little update was made after a few tweets here and there. My point here is not about the silly questions you can ask to a child AI. There are huge understanding capabilities in these Voice Assistants, I was really surprised. A lot of investment and developments are currently made by the GAFA + Microsoft + IBM to enter these markets. As this AI and Voice Search technology matures... Imagine that the Star Trek Computer is here and ready to answer all the questions, like any other human being would actually do. "I need to buy flowers for mother's day, please order roses and deliver them to her home." Do you really think there will be any space for SEO results? You get my point ? Goodbye SEO, I loved YOU. Because I fell in love with a thing called dataLayer and I always liked to measure stuff. See you tomorrow @ Measure Camp Paris with my first web analytics blog post.